Come build a den at Furnace Park! 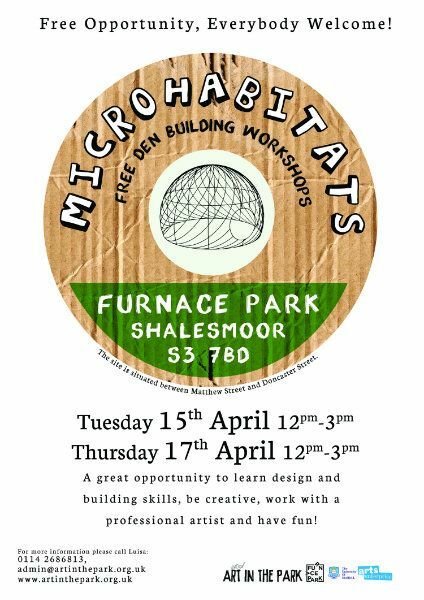 Join us this spring at Furnace Park, where we will be promoting play, exploration and the use of natural and found materials by creating microhabitats! On the 15th and 17th of April, there will be free workshops where families and children will be able to work in collaboration with artists and students to build dens on the site. Furnace Park, once an abandoned industrial space, has been transformed into a creative space for the local community. Both workshops are from 12pm – 3pm, there is no booking necessary. There will be indoor space available if it rains, please wear comfortable and weather appropriate clothing. Find more info about Furnace Park here and more about the workshops here.